LONG BEACH, Calif. — Astronomers are excited by the possibility of using one of two cast-off spy satellite telescopes gifted to NASA to probe for dark energy. They have already come up with a design that would incorporate the spy telescope into the proposed Wide Field Infrared Survey Telescope (WFIRST), a high-priority NASA mission that would hunt for dark energy, exoplanets and supernovae. Though a final review and economic analysis won't be released until April, the new design based on the donated scopes would boost WFIRST's abilities significantly, some researchers say. But the concept could also require more power and a bigger launch vehicle, potentially raising the project's roughly $1.5 billion price tag. "The magic of this telescope compared to existing telescopes like the James Webb Telescope or the Hubble Telescope is it has a huge field of view," NASA astrophysicist Neil Gehrels said during a presentation of the new designs here at the 221st meeting of the American Astronomical Society on Jan. 8. The new proposed design also includes a coronagraph, which can block out starlight to resolve exoplanets and other objects. Another advantage of using the spy telescope is that it may complement existing projects. For instance, the Euclid project headed by the European Space Agency will scan for dark energy — the mysterious force thought to be accelerating the expansion of the universe — but using a wider, shallower survey. The proposed WFIRST design could then go in and probe in more detail, researchers said. 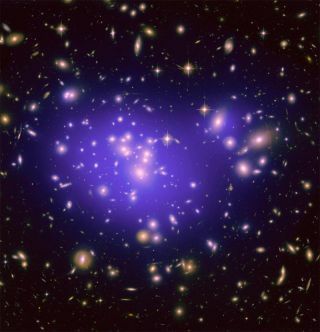 In addition, because the new telescope would have a field of view 100 times wider than that of the Hubble Space Telescope, it could provide accurate counts of galaxy clusters, which is important for dark energy studies, said David Spergel, an astrophysicist at Princeton University who is part of the new proposed design review team. The new design would also provide a better ability to search for the bending of light by gravity, improving the ability to find and characterize exoplanets. The proposed coronagraph could help the instrument find small, rocky worlds, researchers said. And the new telescope could detect thousands of new supernovae, or exploded stars. "For supernova science, it really represents a major step forward," Spergel said. Because the gifted scope has a larger mirror, it will run hotter — currently, at 59 degrees Fahrenheit (15 degrees Celsius). To improve its ability to operate deeper into the infrared spectrum, the design team is hoping to cool it to minus 10 degrees Fahrenheit (minus 23 degrees Celsius). The big telescope might also require a bigger launch vehicle — possibly one that doesn’t yet exist. "It may not be cheaper; it may well be more expensive," Spergel said. While several astronomers argued the new design would probably be cheaper, simply because the major element — the telescope — is already in place, others were not convinced. Ned Wright, an astrophysicist at UCLA who spoke during the meeting, expressed extreme skepticism about the NRO's cast-off spy telescopes, saying the new design was likely to be plagued by cost overruns. "Would anybody like to wager a case of Jameson on the question of whether this could be built by 2024 for less than $1.5 billion?" he asked.